For fans, reincarnation is a controversial topic in itself. Even more so if it is a reincarnation of a “classic” (iconic piece of art). While some say that you should never touch the original, others might not have been born when the original came out and would like to see a remake. This is a neverending debate, but once the remake is “out”, I think most fans simply enjoy watching or listening to it. I have taken David Gilmour: Live at Pompeii (2016) and Pink Floyd: Live at Pompeii (1972) for comparison. 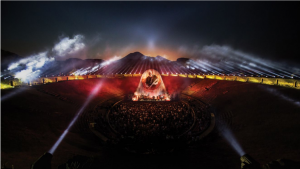 With David Gilmour being a member of Pink Floyd, the title would suggest that this is a remake of the famous concert movie Pink Floyd: Live at Pompeii (1972). But if you have seen both concert films, you will know that they are not at all similar. The reason why I chose Pink Floyd and David Gilmour is simple. Pink Floyd are well known for high audio and video quality and every member has always tried to capture the essence of their shows as flawlessly as possible. Members of Pink Floyd are known for always wanting to push boundaries. They have always experimented a lot in the studio as well as in concert. For instance, during the Animals tour in 1977, they had a huge inflatable pink pig which they would always fire up at some point of the show, giving the whole show much more meaning. But that’s nothing in comparison to the Wall tour of 1979/80. The Wall represents a metaphorical wall between the band and fans. It tells a story, and while it does, workers gradually build a wall from big white blocks. The wall was long enough to cover the whole diameter of the arena and about 12 metres high. When the show reached its climax, the wall was torn down, which some fans described as “most inspirational”; it certainly left them with a powerful memory. 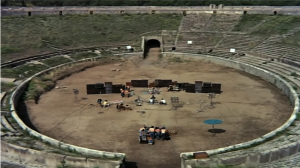 Pink Floyd: Live at Pompeii (1972) is a film of a concert held at the Amphitheatre in Pompeii. The most surprising thing about this concert is that no one actually witnessed it except for the camera crew and Pink Floyd themselves. It was a showcase of six progressive-psychedelic rock songs some of which separated into a number of parts. Many fans consider it to be the best concert film ever made; in their view, it shows Pink Floyd at their peak regarding live performance. This film is well ahead of its time. The pure aggression it was filmed with is still apparent. David Gilmour: Live at Pompeii (2016) is a film of a concert held at the Amphitheatre in Pompeii. Unlike the original, the setlist consists of some of the biggest hits of Pink Floyd’s career and David Gilmour’s career as a soloist. There is an audience, of course; indeed, the concert was sold out. The audio quality is magnificent (every instrument was recorded and edited individually) and the video quality is as real as it can get. I would call it the pinnacle of all concert films so far. There are just two similarities with the original: the film’s name and the song “One of These Days”, which was the only one played at both gigs and so can serve as a point of comparison. If you would like to compare these two concerts for yourself, have a look at the song “One of These Days” from Live at Pompeii 1972 and Live at Pompeii 2016. Both versions are available to view on Youtube. Even though every fan knew it would be nothing like the original, they still praised David Gilmour for doing a show in Pompeii and also for potentially ruining the original legacy. But then again, who but a co-creator has the right to change some aspects of the show? Fans actually enjoy this aspect and see it as a new chapter rather than the ruining of a legacy. What fans do not particularly enjoy is other artists doing covers of Pink Floyd songs. Gilmour did not actually remake the show, he made a new one, and that is the most interesting thing about it. It is easier today than ever before to do a proper remake thanks to the technology we have now. Nevertheless, this is not done often. We prefer to look for new directions for the same topic and to make a brand-new version that might attract a different audience or make more money, instead of mindlessly replicating the exact same thing all over again. While it seems kind of ordinary, this actually shows that when it comes to replicating other people’s work, art in particular, which is a thing everybody has an emotional bond with, we respect the original idea and the atmosphere it creates and are wary of ruining it. When replicating other people’s work, should we try our best to do the work justice or should we engage our own artistic feelings and change the work so that it represents a little bit of ourselves?